A trick shot master capable of serious strikes. Bowler Andy Varipapa was born March 31, 1891 in Carfizzi, Italy. Renowned for his trick shots, Varipapa was also a skilled and accomplished bowler. Varipapa’s antics were featured in the first bowling short film, “Strikes & Spares,” in 1934. It wasn’t his last, by a long shot. Over the course of his career, Varipapa made more trick shot films than anyone else. In addition to his tricks, Varipapa possessed solid skills. He became the first All-Star tournament repeat champ with his 1946 and 1947 wins. 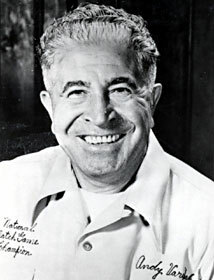 In 1947 and 1948, Varipapa and fellow Hall of Famer Lou Campi took the BPAA Doubles titles. His achievements on the lanes earned him the title “1948 Bowler of the Year,” and Varipapa was named to the pre-1950 First Team by Bowling Magazine. A runner up in the 1952 Masters, Varipapa made up for it in 1957, when he tossed nine strikes in a row on Milton Berle’s Jackpot Bowling. Over the years, he also amassed a Landgraf Classic title, three New York City All Events titles and one New York State All Events title. In 1980, Varipapa was the first bowler inducted into the National Italian American Sports Hall of Fame. He died August 25, 1984 in Hempstead, New York.